HealthInnov, a provider of consulting and technology services to healthcare organizations, relies on Netvibes Dashboards to monitor and analyze data. HealthInnov uses Netvibes both internally to improve its own business processes and also externally as client-facing Dashboards that keep customers informed. As a result of using Netvibes, HealthInnov stays at the forefront of the latest research and technology in the healthcare space, which enables the company to better serve healthcare providers and patients. The health sector ecosystem is rapidly being disrupted by digital transformation. Innovation in the industry is coming from everywhere — startups, patients’ communities, IT and pharma industry giants — and is transforming the way we think, produce, manage and implement health solutions. HealthInnov needs to be consistently on top of the latest information from many different sources in order to provide excellence in healthcare innovation for its clients. After evaluating multiple vendors, HealthInnov determined that Netvibes was the best solution for the company’s needs, due to Netvibes Dashboards’ ease of use and flexibility. With Netvibes, HealthInnov defines its own Internet (the “Personal Corpus”), which covers the area of influence that users wish to monitor for each Dashboard. Deployment of the Dashboard was a quick and easy process with the support of the Netvibes team, which helped HealthInnov to quickly become familiar with the analytics and the management of the Dashboard. 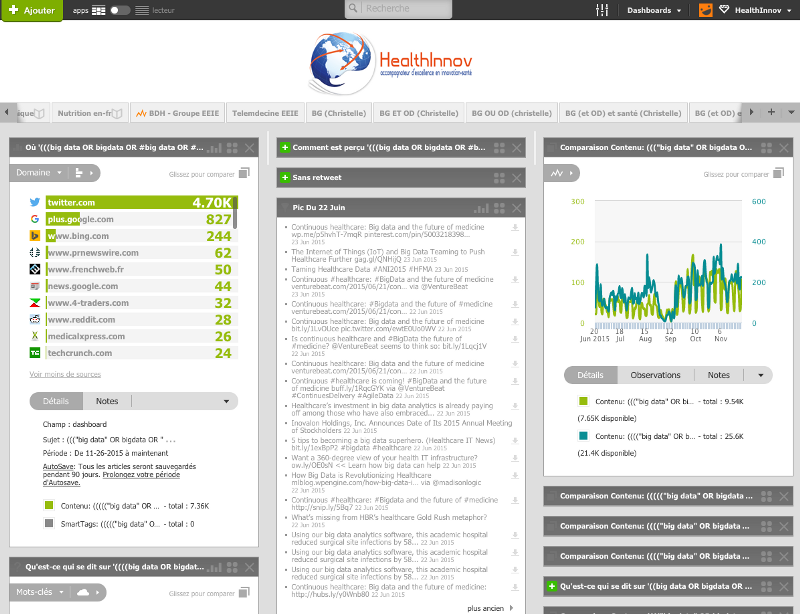 Today HealthInnov uses Netvibes Dashboards to monitor primary areas of innovation in healthcare, such as big data, connected devices, telemedicine, electronic health records, aging independence and chronic disease management. With Netvibes analytics, HealthInnov consultants provide clients with deep and actionable market insights for faster, more confident decision-making across the entire product planning and launch lifecycle. Using Netvibes Dashboards, HealthInnov delivers services including: data on demand, continuous monitoring, geospatial analysis, intuitive search, target lists (customers or institutions) and recommendations to improve decision making with business driven suggestions. HealthInnov also monitors clients’ e-reputation and measures ROI for campaigns. HealthInnov aims to combine the best human intelligence with Netvibes Dashboards. The HealthInnov team has backgrounds in pharma and medical devices, and with their broad experience in the healthcare area and connection to many experts (from medical experts to BI experts), HealthInnov provides unique and outstanding value solutions to the market. With Netvibes Dashboards, HealthInnov not only gathers research, articles and tweets for reading, but they also capture metrics, which are displayed in custom graphics and charts on the Dashboard. HealthInnov and its clients can easily drill into the data, asking questions like what is happening, where, who is talking about it, and what the sentiment is. HealthInnov’s approach delivers unique, multidimensional intelligence for clients, enabling stakeholders to clearly see what happens, analyze data and understand trends, and pilot their business using insights from data. HealthInnov supports them in all aspects of business intelligence and business strategies making the right decisions, accelerating their growth and leading with innovation in their territory. HealthInnov also uses Netvibes to keep teams and clients informed, using PushMail to send automated email reports or to instantly update the news section of client websites. Together, Netvibes and HealthInnov transform millions of conversations taking place across the Internet (including articles, social media, forums, videos and more) into powerful tools that help healthcare organizations to understand the industry and improve services and results. Because Netvibes is a business-oriented tool, HealthInnov is able to offer clients the opportunity to analyze and compare everything that matters to their business. For instance, the organization is able to establish a clear correlation between sales and web data in order to demonstrate ROI. Netvibes Dashboards provide the content, metrics and management tools that HealthInnov needs to make the best decisions and lead the market in innovation. Customers are now more confident and more engaged in the learning journey. Customers are also able to easily engage with other departments and market players to lead with innovation. As a result of deploying Netvibes Dashboards, HealthInnov has expanded its client roster to new companies, including a major actor in the area of healthcare and big data. For this client, big data is everywhere, and there are millions of publications in the healthcare industry being published every day from all over the world. HealthInnov’s consultants select the most relevant articles for the client to push on their website on a daily basis, helping the client to stay informed about the latest innovations while establishing thought leadership in the industry. The Netvibes Dashboard also automatically monitors the client’s e-reputation, issuing real-time alerts in response to triggers. HealthInnov also designs and produces analytic reports for the client on a quarterly basis regarding their business environment and on a monthly basis for the tracking of their e-reputation. The strategic insights provided by HealthInnov enable the client to continue to learn more about its business everyday and lead the industry. In the future, HealthInnov plans to expand its use of Netvibes Dashboards in order to accelerate innovation and better serve its clients, as well as the larger market.